Hello Everyone! I had a great weekend and now just getting ready for the new week ahead. Right now I’m relaxing on the couch watching “The Real Housewives of New Jersey” reunion show– and mentally planning out what I’m going to wear to work next week. The weather is starting to cool off a little bit here in southern California so I’m hoping I can break out some pretty scarves and possibly a jacket or two? I was in serious need of a new jacket– and as much as I love the thrift stores I just couldn’t find anything that either fit properly or looked decent. 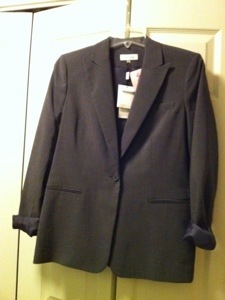 On a whim, I checked out our local Marshall’s and found this great Calvin Klein jacket for a mere $31. It was originally priced at $99! Cha-ching! Problem solved. Pictured below you can see my new jacket paired with a great scarf I found this afternoon at the Humble Hippie in Ocean Beach. I love this place! This was my second visit and of course I couldn’t stop myself from getting something. (here’s the link to my first visit… Humble Hippie) The good news is I’ll be able to wear this scarf with not only my new $31 jacket from Marshall’s but also my leather jacket. Can you tell… I’m a little too ready to break out the Fall clothes… However, as much as I want to break out the Fall clothes now, I’ll likely be complaining about “being too cold” in a few weeks. As much as one can complain about “too cold” in southern California anyway. Cheers everyone! Here’s wishing you all a great week ahead– and happy shopping! 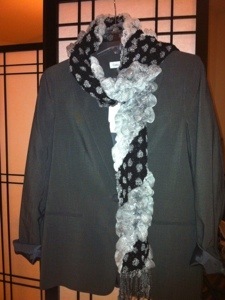 This entry was posted in La Jolla, Retail Therapy and tagged clothes, fashion, shopping. Bookmark the permalink.